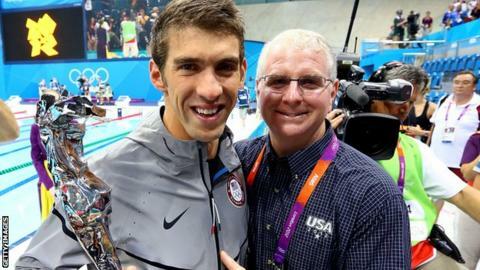 The former coach of Michael Phelps, the most decorated Olympian of all time, will help carry out a review into British swimmers at London 2012. Bob Bowman will join a panel which includes two-time German Olympic medallist Thomas Lurz. "We're sure he will make a massive contribution," said British Swimming chief executive David Sparkes. A review was ordered after UK Sport's target of between five and seven podium finishes was not reached. Bowman coached Phelps from 1996 to 2012 and has been part of the US Olympic swimming team for the past three Games. Having coached Phelps to a record 22 Olympic medals, Bowman is expected to share his expertise with the panel which also includes Harlequins director of rugby Conor O'Shea. Although Rebecca Adlington won two bronzes and Michael Jamieson a silver, British Swimming could now face a cut in funding ahead of the 2016 Games. The medal haul of three was half of that achieved by Team GB four years earlier. British Swimming announced last month that it was to carry out a thorough review following a "disappointing" Olympic campaign. Performance director Michael Scott said: "Following our disappointment at not meeting our high expectations we'll undertake a thorough debrief." What went wrong for British swimming? Read more on British swimming at London 2012 - Did 'home advantage' backfire?